This type of vintage camera is possibly one of the simplest types of camera systems available. Introduced in the 1880s, these cameras come with either a plastic box or cardboard box with a lens on one end, and film at the other. There aren’t many shooting features that come with box cameras and this feature has led to their status as prized collector’s items. For example: the Kodak Brownie camera is highly collectible and beloved by vintage camera enthusiasts. At the start of the 20th Century, folding cameras were introduced worldwide. These portable cameras use a piece of cloth to block out the light and they function like a very basic version of telephoto lens. Zeiss Ikon is arguably the most famous manufacturer for folding cameras which is why if you want a folding camera in your vintage collection, his brand is the one you should look out for. Instant cameras were first introduced by Polaroid in the 1940s and unsurprisingly, many of us refer to instant cameras as “Polaroids” even today. This type of camera allows the user to capture and print a photograph on the spot (although the photo quality is often sacrificed in favor of convenience). However, due to this convenience, many people have started their photography passion with an instant camera. Today, instant vintage cameras are even more valuable because the Polaroid company ceased their production line in 2008. With the introduction of stereo cameras, we were able to capture 3D photos for the first time. Through utilizing two lenses to snap two different images concurrently, an increased field of depth is created when the two images are developed on the same print. If you are thinking of getting stereo cameras for your collection, we recommended Stereo Realist cameras. Rangefinder cameras allow their users to adjust focus with a viewfinder. This allows these cameras to perform superbly in low light environments. One of the most highly sought-after vintage rangefinder cameras is the Leica. With rangefinders, you simply need to turn the wheel on the camera to achieve the best focus, which you can check through the viewfinder. Looking to Sell Your Vintage Cameras? Do you have a vintage camera lying around in your house or any other estate pieces you are looking to part with? 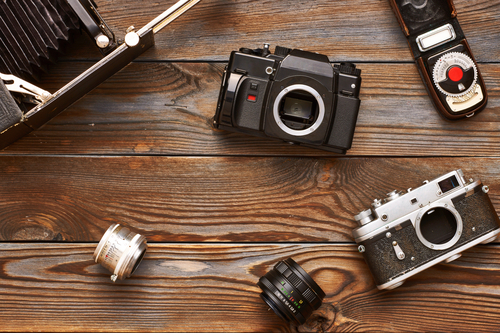 At Showplace Estate Buyers, we buy vintage cameras and can offer you some of the best prices on the market. Contact us to learn more!